The most important factor that plays a role in developing Alzheimer's Dementia (AD) and/or Vascular Dementia (VD) is increasing Age. This simply wasn't an issue 200 years ago in colonial times, when the average age of death was about 31. The long-term East Boston study that followed 2000+ people who did not have AD, concluded that incidence (rate at which new cases occur per year) of AD in people aged 85+ was 14 times higher than for those aged 65-69. The incidence of AD doubles about every five years; for example, the Baltimore Longitudinal Study of Aging (BLSA) found it to double every 4.4 years. 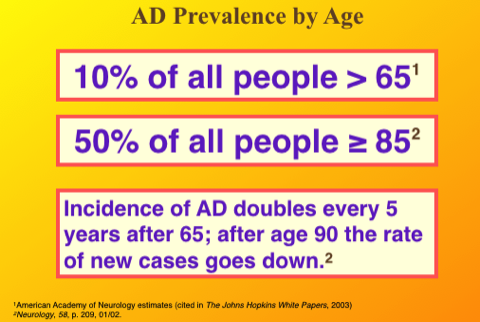 All studies have found AD to double at approximately every five years after age 71. At age 85, the risk of AD is about 47%, or just about one out of two people in the mid-80’s (i.e., one out of the average married couple) has AD. While age is the biggest "risk factor" for developing dementia, there are many factors; e.g. being female slightly increases your risk of dementia. Some risk factors are under our control. Smoking cigarettes doubles the risk of AD for a 25 year period after quitting–so don't start smoking! Repeated mild concussive head injuries can induce a type of dementia that likely leads to AD, just think about all the football players showing signs of Chronic Traumatic Encephalopathy. So far 70 out of 71 autopsies of ex-football players who died of all causes have show CTE. Lifestyle factors are clearly involved in dementia risk, as our best way of preventing dementia involves aerobic sustained exercise (see the section here on Prevention). Lack of social interaction creates increased risk; people in even bad marriages live longer with less dementia than single people. In this writer's opinion, probably the biggest preventable risk for dementia (both AD and VA) is diabetes. In fact, there are researchers everywhere now asking Is Alzheimer's Type 3 Diabetes? Keep in mind that the average age of death for both men and women in 1900 was 47. We evolved over millions of years just to get to age 47, but in just the last 100 years or so we've almost doubled life span. The only way to get these aging bodies we have to function past their date of expiration (around 50) is by maintaining them! See the section on Prevention for ideas about maintenance.